www.castlecomfortstairlifts.co.uk/ where you will find exactly what you are looking for. Even heavy duty stair lifts that will carry about four times the weight of the Castle Comfort model riding on one recently at Naidex. 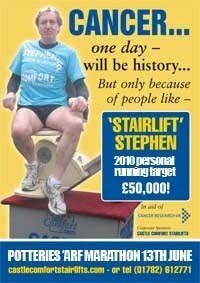 Yes, a stairlift that takes 30 stone! See our video of it made at the NEC Birmingham. 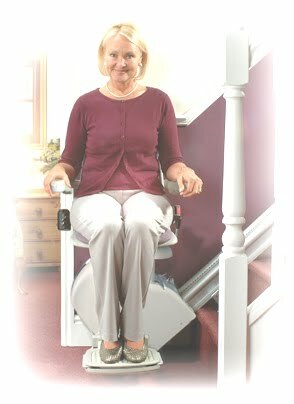 Now, thanks to all those looking for a stairlift in Cheshire and Lancashire, particularly Manchester who entered our competition and generated ££££'s for a very good cause. And those of you looking for our new office in Macclesfield can trust the directions offered from our envied number one, page one entry on Google Maps. Eight people emailed us or sent in the coupon to tell us that the official name of Manchester Airport is. Ringway International Airport, of course. Simple enough quiz? Well, perhaps but as over twenty folk sent in the wrong answer - perhaps it wasn't that easy. Keep in touch with our blogs - and having a look at another test of skill here will give everyone another chance to win a tenner for Stairlift Stephen's amazing effort to raise £50,000. HOW MANY MINERS WERE RESCUED RECENTLY FROM THE CHILEAN MINE AFTER BEING STUCK THERE FOR OVER TWO MONTHS ? email your answer to - quizes@castlecomfotcentre.com and every correct answer will result in £10 being paid by this popular stairlifts company in Stephen's pot. And if a Riser Recliner Chair is later on the agenda - check out this BLOG supreme.